Sister Agnes Marie Gunn, S.S.J. 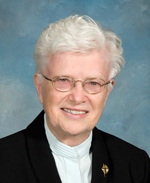 Sister Agnes Marie Gunn, S.S.J., died Oct. 19 at St. Joseph Villa, Flourtown. She was 90 and in the 69th year of her religious life. Born in Philadelphia, she was the daughter of the late Ernest and Agnes Gunn. She entered the Sisters of St. Joseph, Chestnut Hill, from St. Anthony Parish in Ambler in September 1949 and professed final vows in August 1957. Sister Agnes Marie ministered in the archdioceses of Philadelphia and Washington and the dioceses of Camden and Trenton. She is preceded in death by her brother, Ernest Gunn. She is survived by her nephew, Ernest Gunn, grandnieces, grandnephews and members of her Congregation, the Sisters of St. Joseph. The funeral Mass is Wednesday, Oct. 24 at 3 p.m., preceded by a viewing at 1:30. Donations in Sister Agnes Marie’s memory may be made to St. Joseph Villa, 110 W. Wissahickon Avenue, Flourtown, PA 19031-1898.